What Day Of The Week Is November 29? 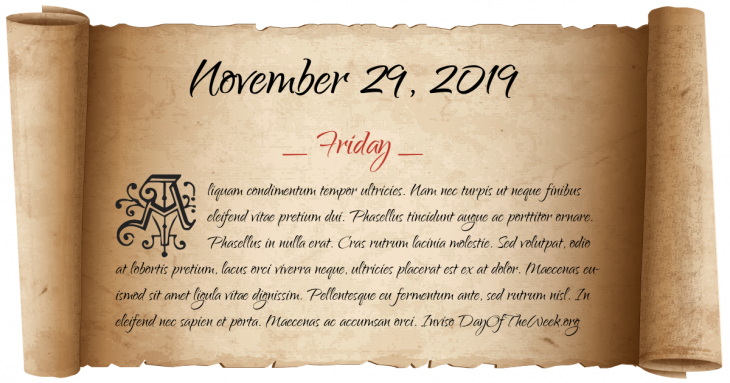 November 29, 2019 is the 333rd day of the year 2019 in the Gregorian calendar. There are 32 days remaining until the end of the year. The day of the week is Friday. American Revolutionary War: The Battle of Fort Cumberland, Nova Scotia comes to an end with the arrival of British reinforcements. San Jose, California, is founded as Pueblo de San José de Guadalupe. It is the first civilian settlement, or pueblo, in Alta California. Indian Wars: Sand Creek Massacre – Colorado volunteers led by Colonel John Chivington massacre at least 150 Cheyenne and Arapaho noncombatants inside Colorado Territory. The Ziqiang Institute, today known as Wuhan University, is founded by Zhang Zhidong, governor of Hubei and Hunan Provinces in late Qing Dynasty of China after his memorial to the throne is approved by the Qing Government. The second session of AVNOJ, the Anti-fascist council of national liberation of Yugoslavia, is held in Jajce, Bosnia and Herzegovina, determining the post-war ordering of the country. Project Mercury: Mercury-Atlas 5 Mission – Enos, a chimpanzee, is launched into space. The spacecraft orbited the Earth twice and splashed-down off the coast of Puerto Rico. The Canadian Space Agency launches the satellite Alouette 2. A 7.4 magnitude earthquake occurs off the northern coast of Martinique. This affected the Eastern Caribbean as far north as Puerto Rico and as far south as Trinidad. Who were born on November 29?